I was just watching an Army Jobs advert on Channel 4, and it showed them piloting an unmanned aerial vehicle with an Xbox 360 controller. I wondered whether this was just for TV, but it seems that US marines have also been spotted controlling an SUGVs (small unmanned ground vehicle) with an XBox controller. I wrote to Army under the Freedom of Information act to find out if it really was an XBOX controller, and here is their reply. Recruitment Video. I have been asked to reply. Microsoft wording on the controller nor a wired headset port. It’s not true. It’s subliminal messaging used to recruit youths, And by the looks of the kid above, it’s worked a treat. I agree with 3, it’s worked well, and i think it’s sick. From a financial and operations perspective I think that using a tried and tested device, such as the xbox 360 controller, would be more beneficial. Whether the army actually uses this device to control UAVs is another question. First of all it would cost a lot more to outsource the research, testing and production of a HID (human interface device) from scratch. All they need here is a programmer to create software which would recognise the input signals from the buttons of the £30 controller. I guess the army also hope that the controller would be a device which prospective recruits would be familiar with – which would mean less time spent training (which costs a lot money). I personally do not believe that the message was subliminal – if it were, it would have been a little less obvious and not a blatent shot of someone using an xbox 360 controller. I just phoned the Army press office, and the guy I spoke to told me that he thought it was unlikely that they would be able to use an xbox controller to control the spy plane as it is “a pretty complicated piece of kit”. He wasn’t able to give me an exact answer as apparently this information is classified. Anyone care to file a freedom of information act request? So as you can see from the update I have made to this post, the Army have now replied to me and clarified that although the controller used by them to fly the plane is very similar to an Xbox 360 controller, it is not quite the same, but it is the real controller that you see in the advert. Wouldn’t it be a lot easier just to drill a hole in the soldiers’ brains and plug ’em in… a la the Matrix? Excellent work by the way. I’ve wanted to know about this for a while but never did anything about it. I’m in Ireland and I’ve seen this ad on some of the British channels over here. I noticed the Xbox 360 controller straight away. My girlfriend was sitting beside me and didn’t have a clue what I was talking about until I picked up my own controller and pointed it out to here on the ad. I was also watching “Future Weapons with Mack” on Discovery Channel. They had an unmanned equipment carrier which was called a Mule. It was remotely controlled and used an xbox 360 wired controller, which was wired into a large transmitter for remote control purposes. On the close-up of the xbox controller on this show, it definitely had the silver and green xbox button on it. 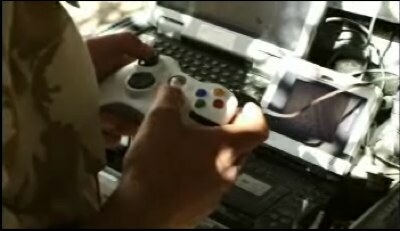 The xbox controller in the army ad above looks, to me, like is also has the xbox silver and green button in the centre. My point about my girlfriend not noticing is because I feel this ad is designed directly to influence young MEN as they play video games by 20:1 probably. I also notice there are no women in that group of people at all. I’m not to sure about how I feel about recruiting young boys like this…. I’ll have to think about it some more!!! are great because they save lot of soldiers.I wish that i could fly them. I would say the military budget probably provides for a much better controller than one from and XBox 360. It is awesome to see some of our technological capabilities! With the age of the guys and gals entering these conflicts, they will have grown up using these console controllers, and will simply be more dextrous, more quickly than they would be with any other controller that the milliatary could supply them I think it’s a simple response, and for once, shows a bit of common sense. A lot of the arguments here against the military using a modified commercially-available controller at this point are as relevant as stating a misgiving about the military not using a pen to write with and wasting money developing their own. The money has been spent developing the UAV itself, not wasted redesigning the interface equipment. Microsoft spent time and money developing the XBox controller with consideration of ergonomics and input/response data speeds among others. Why waste government money on repeating this? The XBox 360 controller was also developed in mind of 2 decades of videogame HID evolution. Any 18 year old has at least some recognition of what such a controller looks like and behaves like – and there is a high likelihood of extensive familiarity. We want our troops to know their tools do we not? It’s just a matter of key bindings. There’s obviously some kind of joystick to control it, and certain buttons make the controller record, snap a picture, stop recording, turning lights on and off. You could reroute key bindings so that A,B,X and Y all do those things. When XBOX controllers first came out with the usb I was already using it to play roms on ZSNES. It’s definitely not inconceivable that the US Army Engineering department can figure out how to use one to fly a plane. But on second thought, the soldiers in the advert you watched were probably just playing Call of Duty in a little bit of spare time. After all, there are a lot of soldiers who play Call of Duty.. A LOT. We dont want a red ring in a combat situation. Found this forum cus I saw Mack using a 360 controller on Future weapons. Season 3 Episode 6. Screenie for your pleasure. As you can see in the screen shot, though a little fuzzy, this is a MS branded controller with the green xbox logo. Mack also mentions using B for backwards and left analog for steering, and right lower paddle button is gas/fwd. Any idea where I could find the advert now? Or if not do you know the title of the advert? I think its mad, obviously a way to recruit video gamers, but even madder I now know its actually used to control military hardware. Being a UAV ground control system developer I can confirm that at least during flight tests regular USB-gamepads are being used. As said it’s cheap, well tested and you can switch to an new one plug-n-play if you break the thing (try do that in an F-16). And the EOD guys also use them for their bomb drone. FYI, the link to the guys controlling the SUGV is showing US Army soldiers, not US Marines. Not a big deal, just wanted to point out the detail. I was born in 1994 too! And Post #3 as well. No no, you don’t understand. It is Microsoft that is using the military designed controller. 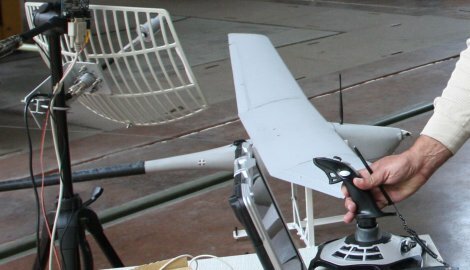 My country (Serbia) developed it’s own UAV, and uses Logitech 3d pro joystick.